This guest blog was written by Sixth Form student Bethh Oliver who joined us in the Cinema For All Office for work experience. I spent quite a bit of time looking through a variety of different international film titles that are available in the booking scheme. I came across a French film called “Crime d’Amour” (which translates in English as “Love Crime.”) I chose this film as I thought it would be an interesting thriller to watch and blog about afterwards. This title is distributed by Arrow Films and was first released in 2010. This is the last of Alain Corneau’s films before he died and I strongly feel that it is a great choice of film to watch. This modern film is based in Paris, “the city of love”. In the first scene we’re introduced to the 2 protagonists, Christine (Kristen Scott Thomas) and Isabel (Ledivine Sagnier) and their agonizing relationship fuelled by dominance and seduction on Christine’s part. 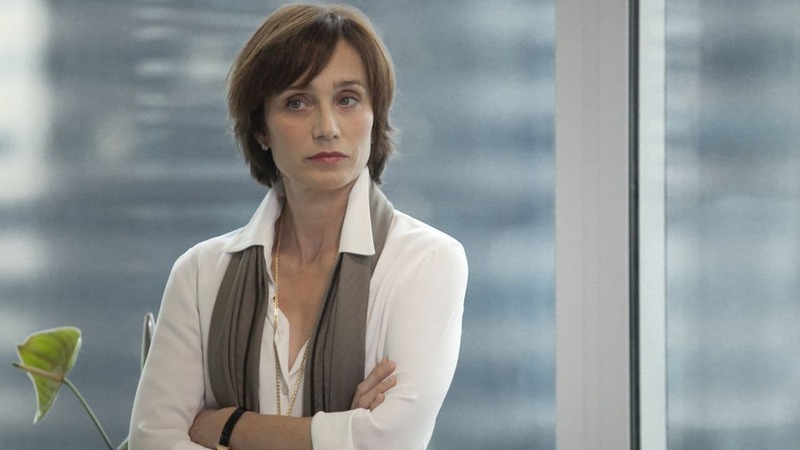 It opens with the two of them discussing business at executive Christine’s house and it is apparent within seconds that she has unprofessional and controlling characteristics, while her innocent assistant Isobel struggles with how to deal with Christine’s conflicting intimate and cold approaches. The film uncovers their complex relationship where their trust for each other is dying, their hate for each other is growing and the tension within the film is rising. Their relationship is visually constructed with the use of their unnerving body language and the close up shots made to emphasise the intense growth of their love/hate relationship. Love Crime accesses an affectionate woman to woman relationship without the display of graphic images. Its focus is more on their emotional bond rather than the physical. Their relationship is a mind game where only one comes out on top. After an ongoing rivalry within their work place where Christine is toying with Isobel, the humiliation Isobel faces soon turns her against her, where Christine then underestimates Isobel’s capabilities and cunning mind of making her way to the top. Soon there’s a deadly feud between the two and Isobel is determined that Christine will not be the one to make the last move. The constant unsettling tone throughout the film is created through the eerie soundtracks that climax the film. The close ups of the agitated facial expressions create the thriller like atmosphere and the integrated flashbacks that are incorporated introduce the psychological genius of the crime that’s committed. The key to a successful thriller is to create the correct pace that keeps the audience questioning right until the last possible moment, which is exactly what “Love Crime” does. It opens up to a world of power and tells the story of a woman and her capabilities when she is pushed to her limits. For an entertaining and thrilling viewing that keeps you guessing ‘til the end book this film for your society now! ← Sci-fi on the Booking Scheme!